Fred. Olsen Cruise Lines is offering guests attractive savings on 46 Ocean and River sailings from June to September 2019, in its new ‘Summer Sale’, on all new bookings made from 3rd April to 3rd July 2019 inclusive. Guests can save up £300 per person on Ocean cruises, and up to £400 per person on Brabant River cruises. 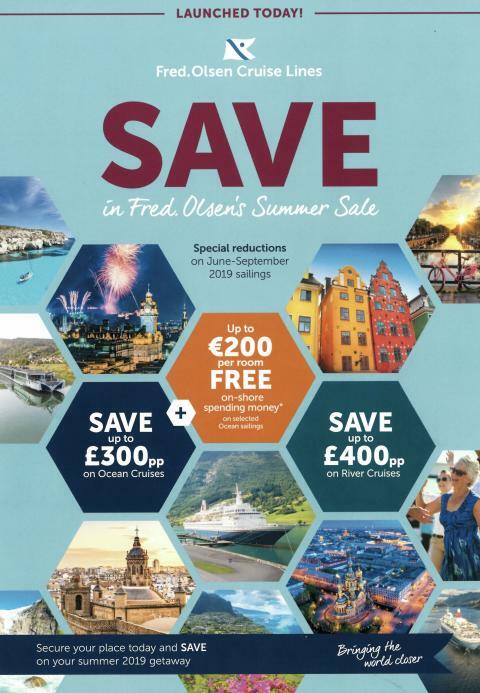 "With over 40 holidays on offer – spanning both our 2019 Ocean and River cruise programmes, departing from ports and airports around the UK and all with special reductions – you are sure to find a ‘Summer Sale’ adventure to tempt you! The itineraries featured in Fred. 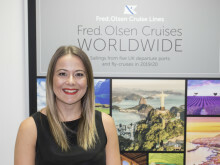 Olsen's new ‘Summer Sale’ brochure are all offered on board its fleet of four smaller, more intimate ships – Balmoral, Braemar, Boudicca and Black Watch – along with 156-guest river cruise ship, Brabant. Sailings include all the firm favourites, from Norway and the Arctic, to scenic French river cruises and leisurely voyages along the Rhine, on a variety of durations, from a ‘One-Night Cruise’ to a 16-night ‘Fjords of Greenland’ exploration. - Brabant’s seven-night R1912 ‘Scenic Gems of the German landscape’ river fly-cruise, ex London Heathrow or Manchester on 20th June 2019, via Düsseldorf, Germany, ending in Basel, Switzerland. Prices start from £1,199 per person. - Braemar’s 14-night M1917 ‘Mediterranean with Lavender in Provence’ cruise, ex Southampton on 9th July 2019. Prices start from £1,499 per person. - Balmoral’s 11-night L1922 ‘France, Spain & Portugal’ cruise, ex Newcastle on 28th August 2018. Prices start from £1,199 per person.